Germán Arduino: PasswordsPro is ready to download (and buy)! 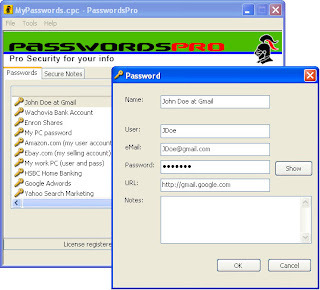 PasswordsPro is ready to download (and buy)! After the presentation of ClavesPC on ESUG 2008 I received some suggestions to release the same product but on English language. Being that the product isn't anymore of my property because I sold it to the company Solo10 we talked and agreed to make an English version with the name PasswordsPro. As usual, I did the product development work and Solo10 the graphics, site and commercial and marketing tasks. As I started the development (when I first developed the Spanish version) with the multilingual option in mind, wasn't a big effort having the two versions living on the same sources and compile each one with a few settings. The same to the installer, developed with NSIS and HM NIS Edit. And, after some days of work, PasswordsPro is here, ready to help protect your private data! Check the screenshots page. And, if you are a smalltalker, be prepared to the offer we are working on. Soon more info, so stay tunned!